Defibrillator Zoll R Series ALS, the worst time to find out a defibrillator isn't ready is at the code. Delays and confusion caused by multiple cables, expired or dried out electrodes, and complicated controls are just a few of the things that can compromise code readiness. And, any defibrillator that doesn't support CPR compromises your ability to resuscitate. No simple self-test will alert you to these things until it's too late. You need a Code-Ready defibrillator - a defibrillator designed to provide clinicians with comprehensive support for resuscitation. Now, for the first time you have one: R Series.The R Series ALS meets the needs of ALS provides in a hospital environment, designed around the 2006 ARC guidelines the R Series features tools to make you more effective in a resuscitation environment. Comprehensive Readiness ChecksOneStep every 24 hours electrodes expiration, electrode gel condition, all circuitry, CPR, pacing, power and parameters are automatically tested. 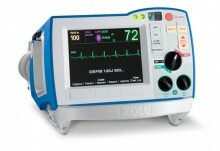 Click the button below to add the Zoll R Series ALS Defibrillator to your wish list.